One of the most spectacular and feminine styles that exist as trends in the world of fashion is the boho or bohemian one, which forms an important part of the fashion lines of many brands. Originally, the etymology of the word goes to the land of Bohemia, having been located on the territory of the present day Czech Republic. Longing for freedom and yearning to break all the accepted rules and dogmatic stereotypes of the world surrounding them, the carriers of these ideology created a very specific and, indeed, unique style, serving as an irreplaceable source of inspiration even nowadays. If you also long to be a bohemian goddess, make sure you know all the rules and style tips on how to wear the boho-chic fashion trend! Historically, boho is quite a young style, having originated as such in the ’60s. So it’s the style of artists, the style of free and beautiful people and just the style of those, who want to be free! If we were to define the boho mood as such, probably we would use descriptive details like joyfulness and openness to the world. The constant search of new inventions and discoveries, the longing towards everything that’s artistic and beautiful and the absolutely free and at the same time harmonious inner world are what the boho style is actually shaped with. • The use of natural fabrics like linen, velvet, chiffon, silk, fur, suede, leather, denim, cotton, etc. • Comfort in everything, especially regarding shoes, which are traditionally made with not too high heels, on platform or wedges. • The existence of floral patterns, checks, ethnic inspired prints, eclectic hints and avant-garde style accents. • High waisted designs, flare finishes, fringes, big accessories, lace, maxi skirts, variously textured pieces, knitted details, etc. • You shouldn’t include more than four shades in the combos if the garments you pick are already catchy and made of some attention-grabbing materials or textures. You may thus use tones like black, gray, beige, or brown as key options, spicing them up with golden, purple, red or bordeaux shades. • For the classy boho style, details like mohair, velvet, and knitwear, often complemented with jacquard deign prints are typical. • For some more romantic looks, the application of soft and weightless fabrics like chiffon and lace is descriptive. Floral decorations, ribbons, and bows are also a good way of creating the romantic and dreamy images. The inclination towards vintage looks is noticeable in this respect. • The following option is the boho hippie style encompassing the characteristic details of the hippie style and merging them with the boho ideology. The outcome of this is the usage of lavish and bright colors, matched with the girly and romantic vibes. • Not to copy others’ styles and designs, but to come up with something individual and creative, and also to be sure to include accessories in the combinations, using them as primary accents. 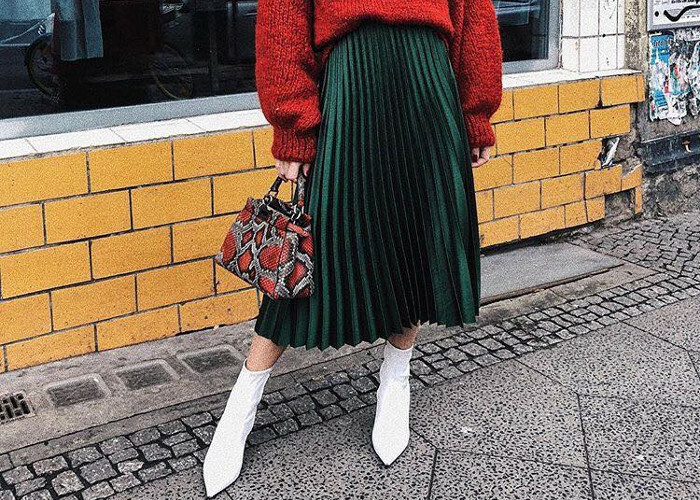 • As for the designs, one primary characteristic feature is the use of multiple layers of fabrics, oversized knitted sweaters topping dresses, a	variety of accessories, and catchy and bright handbags, all put in a charming harmony with each other. • The color palette is the following distinguishing aspect of the boho-chic style, coming with unusual print and pattern solutions, thus also shaping the bright and unexpected tone combinations. This style also allows the use of pastel and neutral shades like gray, blue, and pink in order to create the weightless effect and the softness of the looks. • Materials used for the combinations are just as important, thus coming with similar options as we noted in case of boho looks in general, placing a special emphasis on the natural fabrics used. The easiest way of going boho is incorporating some typical bohemian style clothing into your wardrobe, including maxi dresses or maxi skirts (learn: How to Wear Maxi Skirts), which can be matched with crochet tops, oversized shirts, graphic t-shirts or simple chambray tops. Tunics, slouchy knitted sweaters, ripped denim pieces, like short shorts, jeans or rompers, loosely hanging mini dresses, crochet, denim or fur vests are other typical bohemian style garments. In addition you can also use garments like ripped jeans, velour or velvet pants, cardigans and jackets especially when they are designed with floral prints, trench coats, fur outerwear garments, etc. As for boho style shoes, the exact types of footwear that you need are ballet flats, ethnic inspired sandals having the influence of Greek, Roman, or African styles, cowboy boots, etc., but the most important is that they should be matching the shade of the garments and more preferably come in	neutral tones like beige or brown. For more options, think gladiator sandals or neutral ankle boots, often carrying buckles or fringe details. Coming to bohemian accessories, we can first of all speak about pieces like fedora hats, turbans, headwraps and headbands, colorful scarves and vintage-style sunglasses, bracelets and other jewelry pieces that can become ideal finishing touches for your boho-chic looks! In addition, you can also opt for silver Mexican bracelets, Arabic finger rings, African necklaces, big pendants, etc. Boho is simply perfect for walks with your family or friends, since it’s comfy and cute at the same time, that is, the garments do not limit your movements and don’t act as factors for you to get tired quicker. Boho can easily be interpreted into classic looks as well, that’s why it is also recommended wearing boho to work, of course, taking into account the fact that the quantities of shiny details and the use of more muted shades are	preferable. Another great idea is going boho for shopping. This is again explained with the fact of comfort prevailing in the boho style. Finally, you can also wear the boho trend	at home, since this will become a universal and extremely suitable way of having chic looks everywhere including home! Talking about the exclusions, we may first of all note leather, synthetic fabrics, polyester, and natural fur elements. Fans of this style value boho not only as a style of dressing but also take it as a lifestyle. They often happen to be vegetarians and act for the protection of animal rights. Among the celebrities that love bohemian looks	we can note Kate Moss, who is considered to be the founder of this style, but also	Siena Miller, the Olsen sisters, Kirsten Dunst, Nicole Richie, Mischa Barton, and Neve Campbell. So look like a bohemian goddess, a child of flowers, following the principles of the creation of these romantic and uber-charming looks!